This section contains frequently asked questions relating to research degree study at Edge Hill University. How should prospective students apply? No student can be enrolled or registered for an Edge Hill University research degree without having first made an application and successfully undergone an interview for that degree, regardless of the manner of entry e.g. self-funded, studentship, GTA, transfer from another university. Applications should be submitted through the online form. You should start by reading the Apply page on the Graduate School web pages. Do you accept part-time or distance learning students? As a research degree student, you would be expected to engage with the research culture (including training and development) in your home department/faculty and across the University and sector. Our research degrees are not available through distance learning: you would need to complete the full training programme in semester one of your first year as well as fully engage with the training on offer throughout the rest of your degree, all of which is on campus. MRes is available on either a full- or part-time basis. Professional doctorate is only available part-time due to the nature of this route to research degree. PhD is available on either a full- or part-time basis but EHU prioritises full-time applications over part-time. All part-time PhD applications must be approved by the PVC Research before the applicant is invited to interview so departments should contact GraduateSchool@edgehill.ac.uk at an early stage in the application process. Due to UK Government rules, EHU is unable to offer part-time places to those who hold certain categories of visa. This also means that such students cannot change mode of study from full-time to part-time once here (see ‘Students records & e-mail’ FAQ). Please contact the International Office to check whether the University can sponsor your visa. Do you accept students onto MPhil only? No, MPhil is not available to new applicants. Can Edge Hill University staff study for a PhD at the University? This should be avoided as it can make line-management relationships unclear. However, the University can consider applications on a case-by-case basis if the person intends to do a PhD in a different department (e.g. if FAS) or faculty (if FoE/FHSC) to their own. Such cases will be rare as PhDs would generally be in staff members’ own areas of expertise. All EHU staff applications must be approved by the PVC Research and Director of the Graduate School before the applicant is invited to interview. The faculty should make its support of such applications known through its research lead. If central approval is granted – but before the applicant is interviewed for the PhD – the faculty must remember that the student can be neither supervised nor examined by anyone within the same department (FAS) or faculty (FHSC/FoE) in which they are employed. Staff members undertaking a standard PhD must attend the PhD induction and mandatory training sessions in semester 1 of the first year, as well as the relevant training sessions throughout the degree. Staff are able to undertake a PhD by publication. They should consult schedule D of the Research Degree Regulations in the first instance. Is a bachelor degree required before starting the MRes? Yes, unless you have an alternative qualification which the Graduate School deems to be equivalent. In such cases, you will need to include with your application a formal report in which you demonstrate how the learning outcomes of your qualification map onto those of a traditional bachelor degree. Is a masters degree required before starting the PhD or professional doctorate? A masters is not essential but is strongly recommended, especially for Graduate Teaching Assistants (GTAs) who have a fixed period in which to complete before their funding runs out. A masters degree will help you adjust to the demands of a PhD which differ significantly to those of a taught undergraduate programme. Entry without a masters degree may be possible if you have an alternative qualification or relevant experience which the Graduate School deems to be equivalent. In such cases, you will need to include with your application a formal report in which you demonstrate how the learning outcomes of your qualification (or your relevant experience) map onto those of a traditional masters degree. I already have a PhD. Can I study for another with you? Students who already have a PhD will not ordinarily be considered for a PhD at Edge Hill University except where the intended PhD is in a subject area different to the original one. This may be further restricted in cases where an available PhD place includes funding: because of the rarity of such funds, students who do not already possess an award at the same level will receive priority. I am an overseas applicant. Do I need a certificate demonstrating English language competency even if I have already obtained a degree from a UK university? A degree obtained from a UK university (not online) can sometimes be accepted as proof of English but it is up to the interview panel to confirm it is happy to accept this. Regardless of such proof, if the panel believes that there may be language issues, an offer conditional on a successful IELTS test (or suitable equivalent) could be made. This is especially important where candidates will hold teaching responsibilities. Such conditions must be met before a place can be confirmed: the Graduate School can advise on deadlines for this. If conditions are met after the deadline, the student will need to defer to the next entry point (which may have repercussions for funding). Please contact the EHU International Office for current advice, including which tests are acceptable and the minimum scores required for entry onto an EHU postrgraduate research degree. Are there any criteria that international students must fulfil? Please contact the EHU International Office for current advice. Do all applicants need to be shortlisted and interviewed before an offer can be made? All applications should undergo a shortlisting process (checklist) to determine whether the application should be considered further. This includes applications to transfer registration from another university because departments need to consider certain information. Interview panel guidance is available here. International applicants (from outside the EU) must be interviewed. Home students (UK/EU) should be interviewed if the department considers it necessary before a place can be offered. For example, if there is no prior teaching relationship with the applicant that allows the department to cinfidently assert that the applicant is suitable for MRes entry. All doctoral degree applicants must be interviewed with no exceptions. Interviews should be arranged by the relevant faculty (except for GTAs or Doctoral Tutors which are arranged through HR). For PhD this is normally the faculty’s Associate Dean or a representative of the Graduate School. For MRes, this is normally the Head of Department). two members of staff with appropriate subject knwoledge to be able to assess the subject-specific quality of the proposal: one of the proposed supervisors, and another staff member with appropriate expertise and experience. The gender mix of panels should also be considered. After the panel has made a decision as to whether or not to accept the applicant, the chair provides a completed interview checklist to the Graduate School. Offers will not be sent without both this and the shortlisting checklist. The Graduate School will then notify Admissions/International. Admissions/International will update the applicant record, send an offer, and ultimately pass to Academic Registry to begin the enrolment process. Can a student transfer from another university? In some cases, the University may accept a student who is part of the way through a PhD at another university but who wishes to complete it here. This requires continuous registration on the PhD i.e. if you have withdrawn from your previous university, you should instead apply to Edge Hill as a new student, starting the PhD in year one. We would not normally accept a transfer from someone in the early stages of a PhD e.g. the project registration stage or equivalent. You would not ‘transfer’ per se: you should apply as a new student (so you can be set up on the University’s systems), and be interviewed. You should have already been in discussion with a prospective supervisor by the time you apply, so you or they should notify the Graduate School that your application will be to transfer from elsewhere. Interviews in these cases serve a different purpose than usual: rather than being used as a means of identifying an applicant’s suitability for research degree study, they will be aimed more towards confirming practical details such as resource requirements, stage of study for examination purposes, etc. to ensure the project is viable at Edge Hill. Other than this, the standard shortlisting and interview processes are applicable. Once you move to Edge Hill, you will complete your PhD under our Research Degree Regulations, so the Graduate School will calculate the appropriate viva submission deadlines. Does the University accept visiting students from other universities for a short period of time? Yes although they are visiting researchers/scholars – they are never enrolled on an Edge Hill degree so are not Edge Hill students. They are not completing an Edge Hill research degree, simply carrying out some of their research activity at Edge Hill. The administration surrounding such visitors are the responsibility of the academic department that invites them. There is no central application process for such cases but arrangements should be agreed at departmental and faculty level, ensuring there are sufficient resources (including supervision) and access to the necessary systems for their time at Edge Hill (the department should liaise with IT or Academic Registry). Visiting scholars are charged a fee for their time here: for 2017/18 this was set at £705 per term (UK/EU; students from outside the EU should contact the International Office for fees and eligibility information). Arrangements for durations shorter than one term should be discussed with Academic Registry. International students (from outside the EU) can be visiting scholars but there are additional restrictions. Please contact the International Office for details. If I cannot start as planned, can I defer entry? Yes, although only for one ‘cycle year’. This means that, if you were due to start in October ofyear X but could not, you can defer until October of year Y. But if you need to defer to October of year Z, you would need to submit a new application because too much time would have passed for the details and checks in your original application on our systems to remain valid. You should mention that you had previously applied. GTA only: where should I upload my proposal and CV? They should be combined into a single document and uploaded on the ‘additional information‘ screen of the HR e-Recruitment/online application system. Please contact HR for further advice. What funding is available for prospective students? Funding for PhDs is competitive and may come from a variety of sources. Graduate Teaching Assistantships (GTAs), usually advertised on an annual basis between January and Easter. These studentships are fully-funded by the University and involve the successful applicants undertaking some teaching duties. Doctoral Tutors (DTs), funded partially or entirely by research project funding obtained by EHU academic staff from external sources. As such these can be advertised at any point in the year as the funds become available. As with GTAs, DTs will undertake some teaching duties. Both GTA and DT studentships will be advertised on the EHU web pages (the academic department, Graduate School and HR) and may also be found on external sites such as jobs.ac.uk and FindAPhd.com. Self-funding is a long-term financial commitment and may not be feasible depending on the individual’s circumstances. Self-funded students may be able to undertake some teaching duties but this is not a requirement. Government-funded PhD loans of up to £25,000 are expected to become available in 2017/18. Charities, trusts, foundations and philanthropy may offer funding but this is likely to be a small amount with specific eligibility criteria (e.g. area of residence, particular demographics). Research Councils allocate funding to some universities for PhD studentships. At present, Edge Hill University is not part of a Doctoral Training Centre and is therefore not eligible to receive Research Council PhD funding. Is there a discount for former Edge Hill students? At the time of writing (02/02/2018) Edge Hill graduates, ERASMUS+ and Study Abroad students applying to the MRes can receive a 50% fee reduction if they have not already received a fee reduction for another postgraduate degree at the University. There is no reduction available for PhD study. Queries on tuition fees should be directed to the Academic Registry Fees Team. I will be submitting for final viva soon. Do I need to pay the full year’s tuition fee? Students may be eligible to move to a writing-up fee instead of paying the full year’s tuition fee. Students must meet certain criteria for this however. The writing-up fee will run for twelve months or until final viva submission (whichever is sooner). After submission for the final viva, students will not be required to pay the full tuition fee but may be liable for either an amendments fee or resubmission fee depending on the outcome of the viva. 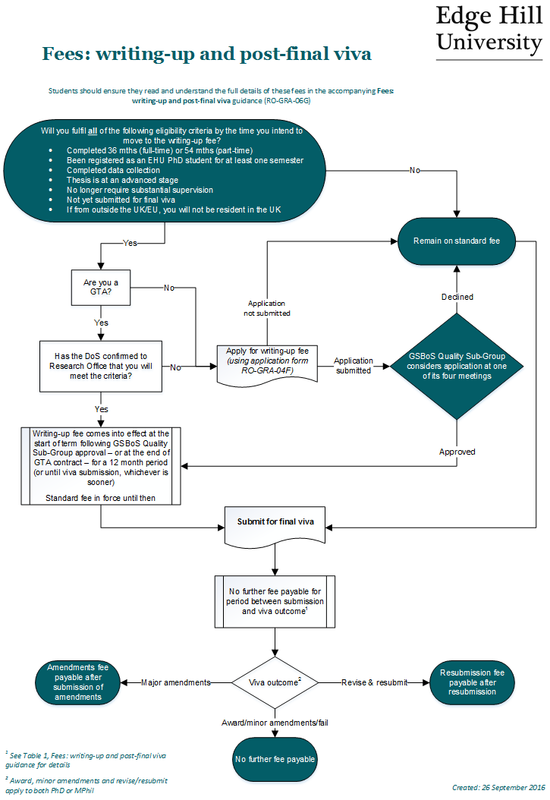 Full details on the writing-up and post-viva fees can be found in the guidance and flowchart. How do I submit my thesis? Submission for final viva: to the faculty PGR administrator (cc: GraduateSchool@edgehill.ac.uk); one electronic copy plus at least three soft-bound hard copies (one for each examiner and the viva chair). Submission of the final approved thesis for archiving: to GraduateSchool@edgehill.ac.uk; PDF only, accompanied by a final thesis archiving sheet which will be uploaded to the research repository with the thesis. The thesis is uploaded to the research repository by Learning Services and harvested from there by the British Library for its EThOS catalogue. Formatting requirements at each stage are provided in Schedule A of the Research Degree Regulations. How should I bind my final viva thesis? Theses should be soft bound (or stronger). The University Library offers a binding service, while the Graduate School has also loaned a comb binding machine to the PGR room which is capable of binding 300 pages (combs up to 38mm in width). Some companies also provide a binding service but the University does not pay towards any costs of binding theses. How should I submit my thesis if it contains interactive material integral to the thesis (e.g. web links, video, other media)? Provided to examiners in both hard copy and electronic copy, as per any other thesis. Simply provide the relevant links and clear instructions as to what the examiners should be reading/viewing. Must be submitted as a PDF for archiving so any content integral to the thesis, such as interactive media, web pages or audio-visual media, needs to be accessible to readers of the thesis in perpetuity so they can view the content/features as necessary even after the host web site inevitably closes years after upload. Schedule A of the Research Degree Regulations advises students to seek advice from Learning Services on how to embed such content into the thesis. For example, you may need to embed offline copies of the relevant online content within the final thesis, linking to them as though they were online (where it is necessary to maintain context). evidence of acceptance by the Archive if archiving is not complete by the date award is sought. URLs to the live content for EHRA until such time that the content is available through the UK Web Archive. URLs to the content on the UK Web Archive once available. The interactive thesis in the form of an eBook or similar may be advisable to ensure the reader can experience the content in its intended state. In all cases, the final version of the thesis should be accompanied (as a separate document) by the Final thesis archiving sheet to confirm there are no copyright issues. Can I restrict public access to my thesis? The research degree regulations state that all theses are considered public documents so you must apply to GSBoS before submission for final viva to exempt your thesis from this. Ideally, applications should be made before or at the time the supervisory team submits the Final viva: examination team proposal form (RO-GRA-09F) (using Appendix 1 of the form). You must provide a suitable justification for the exemption, explaining to GSBoS why it should grant approval. The intention to publish is not in itself grounds to restrict access to a PhD thesis: many theses are subsequently published as monographs but few are published without undergoing substantial alteration. The creative component of a thesis will be/has been published unchanged from its current form. If approved, GSBoS may require that the thesis be submitted in two volumes: the creative component which will not be made accessible but will be retained by the University and the analytical commentary which will be made accessible. The thesis includes material owned by a third party so cannot be made publicly available due to copyright. The thesis will still be made publicly accessible but you should seek content owners’ permission to include the material as soon as it is clear the content is needed (i.e. during writing). If owners’ permission is not granted, you should redact all copyrighted material (ensuring signposting to it where possible). You are legally liable for any copyright infringement in this scenario. The thesis includes other sensitive information (e.g. security, commercial, or other reasons). As with copyright, you should redact any such material as necessary. If this is not practical, you should apply to have the entire thesis made exempt. The analytical commentary will be made publicly accessible through the repository. You need to provide the applicable DOIs for the articles in question within the analytical commentary. You should have already uploaded your outputs to the University’s research repository. The presence of a publisher’s paywall is irrelevant for this purpose: you are simply directing the reader to the outputs, not guaranteeing access (although you will have considered matters of open access prior to submitting the articles for publication). Can third parties use the thesis (e.g. add it to their own libraries) after the PhD has been awarded? Copyright for PhD theses rests with the author so, provided the thesis does not contain any third party copyrighted material, the author is free to allow re-use as they see fit. Please note that all full theses are made accessible to the public through the University’s research repository and through the British Library’s EThOS catalogue after an award has been made so it may not be necessary for other parties to add a separate copy to their collections. Viva panels do not award research degrees, rather they recommend to the Graduate School Board of Studies that an award should/should not be made. If amendments or resubmission are required, you do not need to wait to hear from the Board. If you have carried out the necessary changes to the examiners’ satisfaction/you are successful in your re-examination they will recommend to the Board that an award should be made. When the Board has approved the recommendation of the viva panel, the Graduate School will send formal confirmation to your Edge Hill student e-mail address. In all cases, the date of award will be the date of Board approval. When will I graduate and how are arrangements made? There are two graduation ceremonies: July and December. There are fixed cut-off points for each ceremony so GSBoS must have all the information it needs to approve an award by around the second Friday in June and November respectively (may vary each year). This will give Academic Registry time to update your student record and give its Ceremonies Team time to add you to the ceremony. In all cases, when GSBoS notifies Academic Registry that it has made an award, Academic Registry will update your student record and the Ceremonies Team will contact you to confirm attendance at the next appropriate graduation ceremont, providing the necessary details regarding tickets, gowns, etc. When can I use the title, ‘doctor’, etc.? You can call yourself ‘doctor’ from the date on which the Graduate School Board of Studies approves your viva panel’s recommendation that you receive the award i.e. not the date of the examiners’ recommendation for award. Likewise, if you are an MRes student, you have an MRes from the date ofn which the Board approves the award, not the date of your examiners’ recommendation. What information forms the title of my award? Degree certificates state you were awarded a ‘Doctor of Philosophy’/’Professional Doctorate’/’Masters by Research’ followed by the title of the thesis. The subject/course title attributed to your student record (e.g. PhD English) is solely for the University’s administrative systems and does not appear on your certificate. When will I receive formal confirmation of award? The Graduate School will notify you of the date of the award as soon as possible after the Graduate School Board of Studies has approved it. Academic Registry will normally send your certificate to you within two months of your award. If you have any queries relating to your certificate, please contact the Assessment Team in Academic Registry. How do I receive my certificate? Certificates will be sent to the student’s address as recorded on the student record system; if the you leave that address before receiving the certificate, you should notify Academic Registry immediately. You must submit an intercalation request form (RO-GRA-07F) to the Graduate School in advance of the proposed interruption start date, providing suitable evidence to justify the request. Please see the Research Degree Regulations, Academic Regulations, and intercalation policy for guidance on appropriate reasons. Retrospective applications and applications submitted within a short period (e.g. circa two weeks) before the start date will not be considered unless there are exceptional mitigating circumstances (and appropriate evidence for them) behind the late request. Requests submitted without appropriate supporting evidence will not be considered. If you are seeking an extension to a viva submission deadline, you must submit an extension request form (RO-GRA-19F) to the Graduate School in advance of that deadline, providing suitable evidence to justify the request. Not having completed the work in time is not in itself an eligible reason for extension. Retrospective applications and applications submitted within a short period (e.g. circa two weeks) before the deadline will not be considered unless there are exceptional mitigating circumstances (and appropriate evidence for them) behind the late request. What is my annual/sick/parental leave entitlement? Research degrees are not contracted employment so you have no entitlement to annual leave or sick leave, and no automatic parental leave rights. Furthermore, the programme is not broken into semesters or terms but spans the full 52 weeks of the year so there are no designated summer, Christmas or Easter ‘holiday’ periods for students. So, while it is possible that you will fall ill, have a child, or choose to go on holiday with the agreement of the supervisory team at some point during your degree, these occasions will not pause your registration on the research degree or extend any submission deadlines unless an intercalation or extension have been approved by the Graduate School Board of Studies. If you are on the EHU payroll (e.g. GTA, DT, other staff) you will have annual/sick leave entitlements but they apply only to your contract of employment (e.g. teaching duties), so leave from your paid position neither pauses nor extends your research degree registration in any way. Your dual roles are mutually exclusive in the same way as non-EHU employee and EHU student roles. All students (inc. those on the payroll) must seek intercalation or extension through the correct channels as a student in addition to any such approval sought from line mangement as an employee. Any questions relating to contracts of employment or pay should be directed to Human Resources or Payroll. The length of any studentship you hold will not automatically be extended as a result of a period of sickness absence: the contract is usually fixed term with a fixed end date, regardless of any period of academic suspension/extension. The Faculty could choose to extend the contract as it could for any fixed term contract but this would be a matter internal to the Faculty in question because there are budgetary implications. External funders may also have more stringent rules. If you are planning on taking a holiday you must remember that your research degree deadlines are unaffected by your elective break. Failure to meet a submission (or any other) deadline because of a holiday will be treated the same as any other missed deadline. You should therefore plan holidays around your obligations as a student. These obligations include but are not limited to: attending training, submission for viva, attendance at viva, submission of annual appraisal (where GSBoS deems it applicable), engagement with the progress review process. Holidays are not grounds for intercalation, extensions to any deadlines (viva or otherwise), or for non-attendance at a viva. If you wish to suspend your studies for the purpose of parental (or adoption) leave, you must apply for an intercalation. Without an approved intercalation, your studies will not be suspended, even if you have approved parental leave from your contracted employment (whether at Edge Hill or elsewhere). The only way in which employment and PhD registration interact is that a studentship holder’s status as an EHU employee is entirely dependent on their continued status as a PhD student: if they leave the programme, their employment ceases. However, if a studentship holder relinquishes the studentship they are still able to continue on the PhD as a self-funded student. Which e-mail address will the University use to contact me? When you first enrolled, you were provided with a student e-mail address that remains active throughout your entire period of study, and which therefore allows us to maintain a consistent mailing list. As such, we will only use your EHU student e-mail address to contact you about your research degree, regardless of whether you have an EHU staff or any other e-mail address. You should therefore actively monitor your student account. You can do this via webmail if you are not on campus but, if you wish to access your e-mails via an app, or auto-forward e-mails to another account, you should first check with IT Services as this may contravene the Acceptable Use Policy. N.B. it is your responsibility to ensure you receive and act upon (as necessary) e-mails sent to you by any part of the University; failure to monitor your student e-mail account could result in you missing a deadline or other important piece of information regarding examination, progress review or your student record, and is not grounds for an extension to any deadline. If you also have staff status, you should note that, when your contract of employment ends, your staff log-in will automatically be deactivated so you will no longer be able to access your staff e-mail account or network folders linked to the staff log-in. What should I do if I have a problem with my student e-mail/network accounts? Contact the Learning Services helpdesk: http://askus.edgehill.ac.uk/. New students should have received a letter containing their log-in details when they enrolled. Where can I check or amend information on my student records? Updates to your registration (mode of study, intercalation, supervisory team, etc.) should be sent to GraduateSchool@edgehill.ac.uk, using the necessary forms where provided (see Blackboard). Students can view and edit some of their details on the intranet. Any amendments to your personal details that you cannot make online can be made through Academic Registry. What support can be provided to students with learning difficulties such as dyslexia? Learning Services’ Specific Learning Difficulties (SpLD) Support Team can help students to work with their learning difficulties. N.B. learning difficulties should be taken into account during the student’s studies well before submission for viva e.g. dyslexia is not grounds for special dispensation during a viva. What happens to my remaining viva submission deadlines following a change of mode or change of programme? This will have the effect of either shortening or extending the remaining period of registration. What happens if a part-time student becomes a GTA or DT? In such cases, you will change mode of study from part-time to full-time. Your remaining viva submission deadlines will be recalculated by the Graduate School: as GTAs and DTs are full-time studentships your period of registration will be shortened after a change from part-time. Unlike cases where the student submits a request to change to mode of study, a change of mode from part-time to full-time by way of a GTA or DT contract does not require GSBoS approval but will take effect on the contracted dates. GSBoS must still formally note the change and your faculty must provide copies of the contracts to the Graduate School so the deadlines can be recalculated. If the contract is for a fixed term and expires before you have completed the PhD, your registration will automatically revert to the original mode after the contract expires and the remainder of the period of registration must be reclaculated once more by the Graduate School. Again, this will be noted by GSBoS. Can an international student change mode of study from full-time to part-time? Due to UK Government rules, international Tier 4 (General) student visa holders cannot study part-time, so they are unable to change mode of study. holding a UK or EU/EEA passport but who are classed as overseas for fees purposes. Does the Director of Studies need to have previously supervised to completion? No, as long as the supervisory team as a whole includes at least one supervisor who has previously supervised at least one student completion (at or above the level of degree sought), any member of the team can act as DoS, provided they are EHU academic staff. The DoS should be the supervisor with the most relevant expertise for the student’s project and who will be the most involved with the student’s progress. Can staff external to the University form part of the supervisory team? Professional doctorate: yes, this is central to the degree. PhD: yes, although it is not required. External supervisors/advisors must have appropriate experience and expertise. Expenses for travel/accommodation where appropriate and eligible according to the standard EHU Finance rules. Values shown are standard EHU amounts for guidance; departments can in fact pay whatever they choose but the amounts should be agreed with the external supervisor prior to their joining the team. What is the structure of research degree supervisory teams? Teams may not exceed four people (max. two external). All proposed supervisors must be approved by the Graduate School Board of Studies. If an eligible team cannot be aproved and maintained, the student’s registration on the degree wiill have to be withdrawn. What is the difference between a supervisor and an advisor to the project? A supervisor is a research active member of the supervisory team who engages with supervision of the student and their project. An advisor will not engage in the supervision of the student/project and may not be research active but brings specialist, project-relevant expertise to the team (e.g. from a professional or other background). Supervisors and advisors may be internal or external to the University. Regarding payment, an external advisor is treated the same as an external supervisor. What is the deadline for research project registration submissions? What happens if I miss a viva submission/resubmission deadline? Vivas are formal examinations for which GSBoS is the examination board so the submission deadlines are strict. It is therefore important that you plan ahead and, if there are valid grounds, submit an extension request in advance of the deadline. The University’s Academic Regulations state that late submissions for assessment shall be awarded a zero mark and students are entitled to one re-assessment. This means that, when you eventually do submit for and undertake your viva, it will be considered a second submission/re-examination, removing the option for revision/resubmission from the examiners. If you miss your deadline, the Graduate School may give you a new deadline of up to 10 working days after the original deadline. Failure to submit by the new deadline will be considered examination failure and result in the withdrawal of your registration on the degree. The final viva submission deadline is your maximum completion date – the date after which you will cease to be a registered student (pending examination). If the submission is not made by this date you will, by definition, no longer be registered and cannot submit for examination; you will have “timed out” of the programme. Do viva examiners need to hold a PhD? Do viva examination teams need formal approval? All examination teams should be assembled according to the research degree regulations. Examination teams do not require approval. The same examiner cannot be used for more than one viva (inc. final). Examination teams must be approved by GSBoS. The Director of Studies should submit a final examination team proposal to the Graduate School for consideration at least three months before the intended viva submission date. This will allow time should GSBoS require changes to the proposed team, or further information regarding any request from the student to exempt their final thesis from public access (on the same form) without delaying the viva and inconveniencing the proposed examiners. I am an examiner on a viva and have recorded my report as an audio file. Who can transcribe it for me? Unfortunately, neither the faculty research degree administrators nor the Graduate School have capacity to carry out this task so transcription of examiner reports, etc. on behalf of staff should be arranged within the staff member’s department. Alternatively, staff can use transcription software such as Dragon but should be mindful of the need to thoroughly proof-read the output. I am on a viva panel. Can you provide me with a copy of an examiner’s CV? CVs are provided to GSBoS for the sole purpose of approving the examination team and, because they are considered personal data under the Data Protection Act, we are unable to share them beyond this purpose without the express permission of the owner. You should instead seek out the examiner’s public profile (e.g. on their institution’s website if external). Can a visiting professor be used as an external examiner? Not at all for transfer/progression vivas. Possibly for final vivas on a case-by-case basis: GSBoS must approve all final examination teams so may approve a visiting professor as external examiner provided they are a visiting professor outside the student’s home department (FAS only) or faculty (FoE/FHSC). They must not have had any prior involvement with the student’s project. Can someone who was involved in the project as a participant act as external examiner? No. While there may not be any potential consequences in all cases, this nevertheless represents a conflict of interest which could result in an appeal against the recommendation of the viva panel. How often can the same external examiner be used? An external examiner can only examine any one student at either transfer/progression or final viva, not both, so supervisors should consider which viva they would like an external to examine most. Departments/areas should also avoid overusing an individual external examiner for multiple students’ vivas wherever possible. How much do external examiners get paid for their time and what does the payment cover? External examiners on transfer, progression or final vivas are paid a flat fee of £180 plus travel expenses (travel within the UK only; rail fare or mileage as per the EHU Finance expenses policy; domestic air fare only if cheaper than road or rail). Claims are made using a Visiting Lecturer claim form, checked by the faculty’s research degree administrator, and signed off by the Graduate School. All expenses should be reasonable and in line with the University’s Financial Regulations. The following guidelines apply to travel and accommodation. If the examiner is to undertake other professional duties with EHU (e.g. delivering a public lecture or other event at the University) the academic department responsible for the event will normally cover the additional expenses. Travel costs should be claimed retrospectively by the examiner – neither the faculty research degree administrator nor the Graduate School can arrange travel. The sole exception is where a taxi is needed between the University and a transport hub (e.g. Wigan North Western railway station), which can be booked by the faculty administrator using the University’s taxi account. Travel will only be paid for the purpose of the viva so diversions for other business should be at the expense of the examiner. If an examiner is travelling from outside the UK, either the examiner or the student’s department should cover the international travel costs with the Graduate School paying only the reasonable costs for travel within the UK. Only one night’s accommodation – either before or after the viva – will be provided unless the viva time and travel times from and to destinations within the UK necessitate a second night. Accommodation must be on campus if available (e.g. in The Hollies). If on campus accommodation is not available, suitable accommodation nearby may be booked. Accommodation in Liverpool or in another location chosen by the examiner for social reasons or reasons other than the viva, will not paid by the University. Does the external examiner get paid again for a resubmission? Revise and resubmit – the external examiner should be paid the flat fee of £180 for re-examining the submission plus travel expenses where a viva takes place (i.e. it is treated as any other viva). Make amendments, examiners only confirm the specified amendments have been carried out, they do not not re-examine the thesis, so no fee or expenses are payable. Which version of the regulations/rules/guidance applies to me? The regulations that apply to you at any given time are the ones that took effect at the start of that academic year. This means you should familiarise yourself with the regulations every year to ensure you do not risk your registration on the programme. A previous version of the regulations could take precedence but only on the rare occasion that a change to the regulations significantly disadvantages you e.g. where you worked towards a maximum thesis word count allowed by earlier regulations that were in effect but a recent update significantly reduced the word limit just before submission, allowing no time to amend the thesis without substantial adverse effects. You should contact GraduateSchool@edgehill.ac.uk as soon you believe an update to the regulations may adversely affect you in this way. GSBoS would need to approve any deviation from the current regulations. It is the version that is in effect at the time of the event in question e.g. intercalation, writing-up fee, progress review, PGR Bursary, etc. The current versions of documents are those available online so you are strongly advised against saving local copies for future use; you should instead download the current versions when needed. I cannot open/use the form provided on my PC or Mac. Can you provide a different version? Edge Hill University is primarily PC-based so all documents produced by the Graduate School are created on a PC, using current institution-wide software (Windows 10, MS Office 2016 as of January 2018). Until such time that we can provide browser-based forms, some users may encounter difficulties when trying to complete Word-based forms. Word 2016 often defaults to ‘read mode’ when you open a document, which makes the document read only. Switch your view to another mode (e.g. print layout) to allow read-write. If using a version earlier than Office 2016, installing Microsoft’s free Office compatibility pack should resolve compatibility issues. Microsoft will retire the compatibility pack in April 2018. Microsoft Office is not fully-compatible with Apple operating systems so some features will not work for you (e.g. drop-down menus). You will need to complete the form on a PC instead. How many hours per week are students expected to devote to the research degree? The time you commit might be spent on a range of project-related activities (so not just reading, writing, data collection, and so on) but you will need to engage with the research culture in your department/faculty and across the University/sector, so you should carefully consider the amount of time you need to dedicate to your research project when making other commitments. Which referencing system should I use? There is no mandated referencing system for a research degree: you should discuss with your supervisors the most appropriate format for your discipline. Do GTA/DTs have different deadlines/requirements to other PhD students? No. GTAs and DTs are PhD students like any other and they must adhere to standard deadlines and regulations. The only difference between GTAs/DTs and other PhD students is that the former are funded by the University and have limited teaching support duties as part of their studentships. It should also be noted that, although they receive certain benefits as a side-effect of being on the staff payroll, GTAs are students first and foremost: their staff status is entirely dependent upon their continued student status. What happens if a GTA/DT has not submitted for final viva before the three year contract ends? It is important to keep in mind that the overall period of registration as a PhD student is longer than the GTA (or DT) contract so you are expected, though not required, to complete your project within the three years. Should you not have submitted your final thesis before your studentship expires, it simply means that the role of GTA and its associated benefits cease and you become a standard PhD student, liable for either tuition or writing-up fees. You should note that, when your contract of employment ends, your staff log-in will automatically be deactivated so you will no longer be able to access your staff e-mail account or network folders linked to your staff log-in. Your student log-in remains active for the duration of your student registration so we recommend you use that for your entire time here.